After receiving FAA certification in June 2011 and EASA in April 2012, the Beechcraft King Air 250 is one of the most popular business turboprops in the world. It is routinely configured for use as an air ambulance and for inspection, surveillance and transport duties. Thinking of buying a King Air 250? Read the specifications below. The King Air 250’s 16.7ft long cabin has swivel and recline leather seats, with a standard seating set up for seven people, but has a maximum passenger capacity of 10. It also has fold-out tables, WIFI and power outlets, alongside noise-reduction technology. The two Pratt and Whitney Canada PT6A-52 engines have power of 850shp each, giving the aircraft a maximum cruise speed of 315mph and a maximum range of 1,766 miles. The cockpit is set up for two pilots and has the Rockwell Collins Pro Line Fusion avionics suite, with full touchscreen display, installed. The King Air 250 also has a de-icing system, and turbulence detection technology within its weather radar. 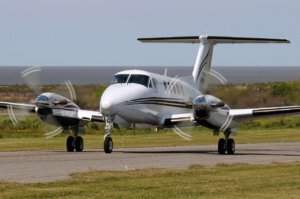 Want to sell a King Air 250?